"One Nation Indivisible" - Chapter Four: "Together, Alone"
Batman manages to stop Hourman while Red Arrow and Wildcat search for and fight Kyle Nimbus. Meanwhile, Green Lantern has been unsuccessful with peace talks between Erebus and Ark Home. At the same time Fury is explain to Hawkgirl about the Amazon/Atlantis alliance. The lost souls of Fury's people were stored in a repository called the Pandora Vessel and placed in crash victims dying of radiation poisoning. This saved lives and could mean the rebirth of Themyscira, but without resources on New Earth 2, resurrection, war, peace and everything in general could be irrelevant. Wildcat and Red Arrow have defeated Nimbus using teamwork and ingenuity. However, in Metropolis, martial law may be put into effect. Wonders may be forced to kill in order to prevent war. 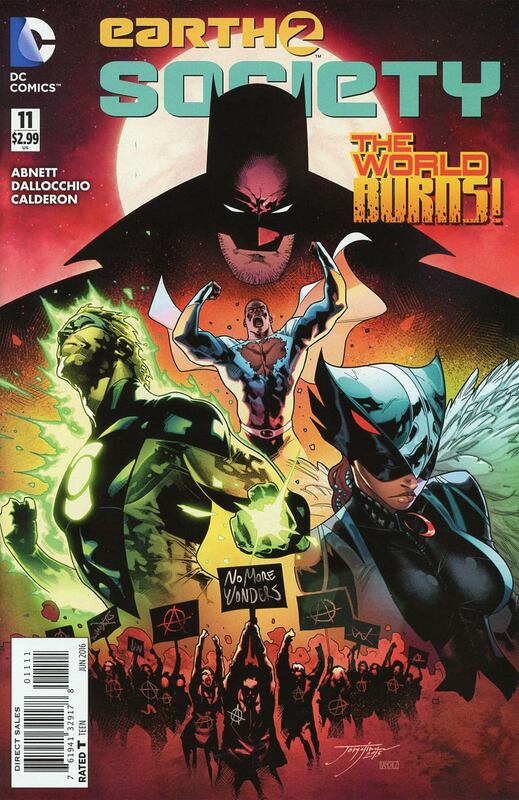 Green Lantern's plans for a peaceful world may have failed, and the New Earth 2 could be on the brink of destruction before their societies and governments have even had a chance to grow. Story - 5: Admittedly, I was hoping for more on Val-Zod in this issue. I wanted to see what would happen next with his character. In fact, he and Power Girl are barely in this story arc compared to other heroes. Still, this chapter was a fast, fun and interesting one. Dan Abnett is one of the best writers in comics, and his work normally means readers will get a good story. He and other writers like him need to be working more these days. Art - 4: While he's no Jorge Jimenez, Federico Dallocchio did a fine job rendering everything. It's just going to take me a bit to adapt to his style. I believe he's slated for the next issue's art. Maybe by the time number twelve rolls around, I'll be more used to the change in visuals. Cover Art - 4: The cover looks like it was drawn in a hurry even if it is well done. I had to knock a point off for that.